It's been a hot minute since I've done the last segment of My Little Beauty Beast and I can tell you that since then, I've accumulated a beauty wish list longer than the hair on Chewbacca's back. To save both of our sanities, I cut down my wish list exponentially so that it only reflects the products that I... ABSOLUTELY MUST HAVE OKAY?!? *sobs. * Alas, money does not grow on magical giving trees--especially when you are a young, pregnant newly wed--so I'll gaze longingly from afar and maybe grab one or two of these slowly but surely. I got diapers to buy, people. Besides that little factoid, I've noticed that my taste has gotten really (inconveniently) expensive lately. Almost every product on my colossal wish list is high-end or borderlining on Marie Antoinette frivolity like this gorgeous Givenchy number. 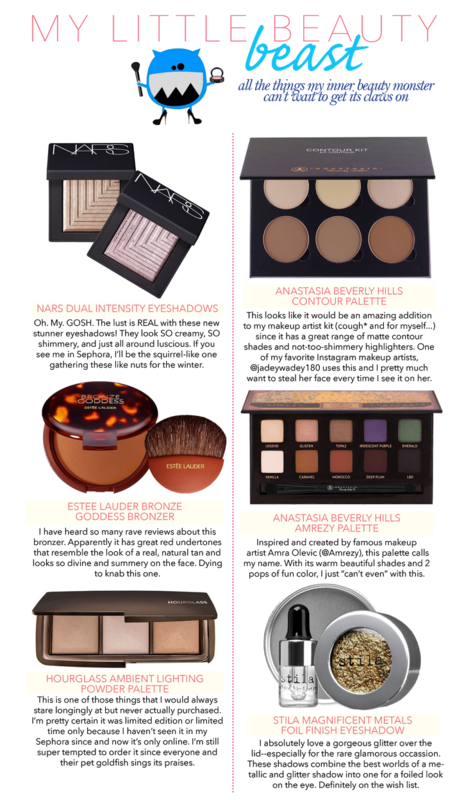 Highlighting powders, bronzers, and all things with a beautiful sheen take up the top spots on my list as well. For example, I've been searching for the coveted limited edition Estée Lauder Heat Wave highlighter for ages now. It's on Amazon and other websites but people are charging insane amounts of money just because they know they can (it was originally $45!). I just want to be a summery, glowy, bronze Aphrodite, okay?